Click the clapper to view today’s featured trailer “We Just Click”. To complement our direct marketing and POP campaign, MDG produced a series of movie trailers promoting the credit union’s services, from checking to savings to online banking. 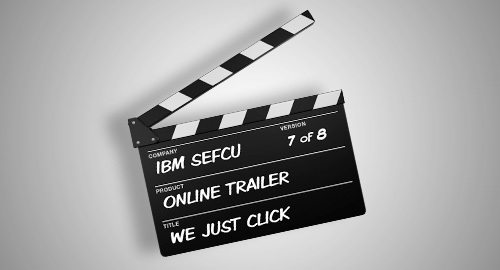 These movie trailers are featured on the IBM Southeast Employees’ Federal Credit Union website promotions landing page. Stay tuned for more movie postings! MDG Advertising handles brand development, creative, graphic design, direct mail, e-mail marketing, sales collateral, member promotions, and media buying for the 22 branches of IBM Southeast Employees’ Federal Credit Union located in Florida, Georgia and Alabama. Michael Del Gigante is president and executive creative director of MDG Advertising, a full-service South Florida advertising agency with offices in Boca Raton and New York City. MDG specializes in developing targeted Internet solutions, exceptional creative executions, and solid branding and media-buying strategies that give clients a real competitive advantage. For more information Contact MDG Advertising.